THE WARS OF THE SUCCESSORS. 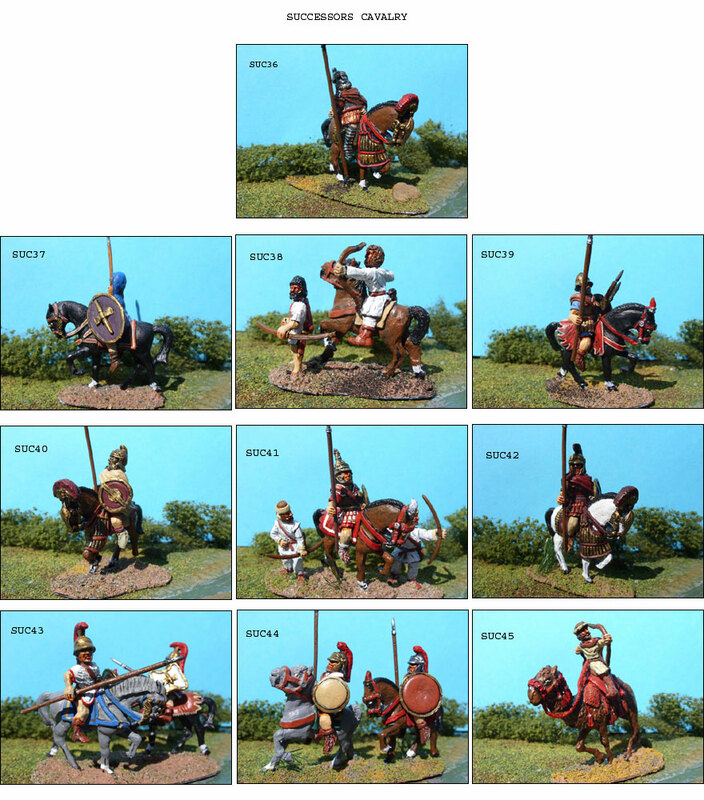 THIS RANGE OF FIGURES COVERS THE ARMIES OF THE VARIOUS STATES FORMED AFTER THE DEATH OF ALEXANDER AND THE BREAKUP OF THE EMPIRE. 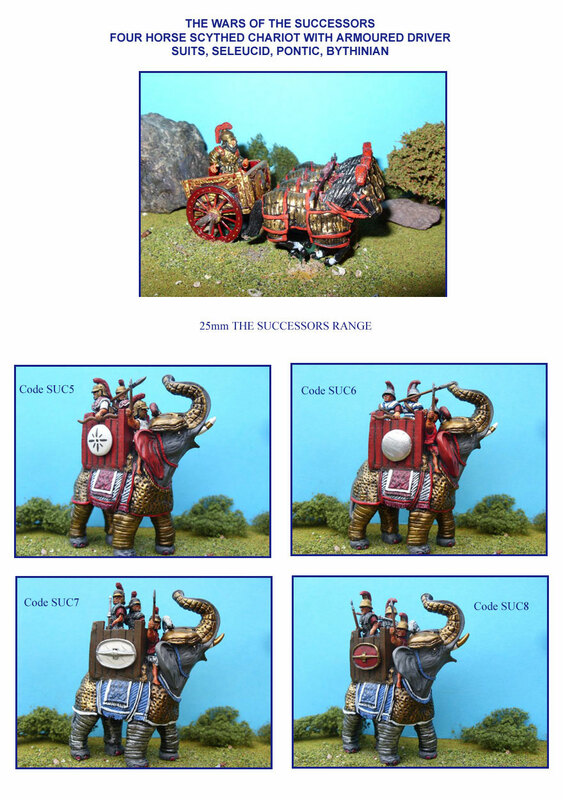 THE â€œ SUCCESSORS â€œ RANGE IS SUITABLE FOR THE ARMIES OF ALL THE HELLENISTIC STATES FROM THE DEATH OF ALEXANDER UNTIL THE ANNEXATION OF EGYPT BY ROME. 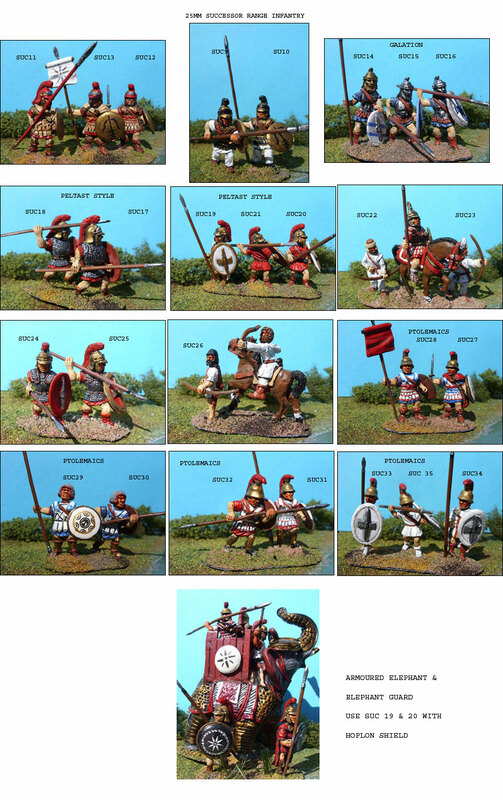 MOST TROOP TYPES WOULD BE FOUND IN THE ARMIES OF ANTIGONUS, LYSIMACHUS, PTOLEMY, SELEUCUS, EUMENES, ANTIPATER AND CASSANDER. IF A SPECIFIC NAME APPEARS IN A CODE, THAT TROOP TYPE IS KNOWN TO HAVE SERVED IN THAT ARMY, BUT THAT IS NOT TO SAY IT DID NOT SERVE IN ALL THE OTHERS, EITHER AS NATIVE OR MERCENARY. TROOP TYPES IN MAIL ARE GENERALLY MORE SUITED TO THE LATER PERIOD WHEN ROME BEGAN TO HAVE MORE OF AN INFLUENCE IN THE EASTERN MEDITERRANEAN. ALL FIGURES ARE SUPPLIED WITH APPROPRIATE WEAPONS. NB; LETTERS THAT APPEAR IN BRACKETS AT THE END OF A CODE i.e. ; ( F, G, or H, ), DENOTE DIFFERENT SHIELD TYPES. PLEASE CHOOSE THE TYPE YOU WANT (SEE THE WEAPONS SECTION FOR DESCRIPTIONS OF EACH CODE USED) WHEN PLACING YOUR ORDER MAKE A NOTE IN THE CUSTOMER COMMENTS SECTION. IF NOT SPECIFIED, ONE TYPE WILL BE SENT. FOR THOSE WHO WANT TO CUSTOMISE THEIR FIGURES OR NEED EXTRA WEAPONS, THEY ARE AVAILABLE SEPERATELY IN PACKS OF 8. FOR DETAILS OF THE SHIELD TYPES REFERRED TO, SEE THE WEAPONS SECTION OF THIS RANGE. FOR OTHER HORSES OPTIONS SUITABLE TO USE WITH THE CAVALRY, SEE GREEK, MACEDONIAN AND PERSIAN RANGES.